This is a tasty, nutritious and filling bread that you can easily make yourself. The olives give the bread that extra special taste. Try it with Greek salad with lots of olive oil! Delicious! Combine all the ingredients except the olives, add enough lukewarm water to make a firm but pliable dough. Knead well for at least 10 minutes. Wrap the dough in clingfilm, place in a bowl and let it rest in a warm, but not hot, place. 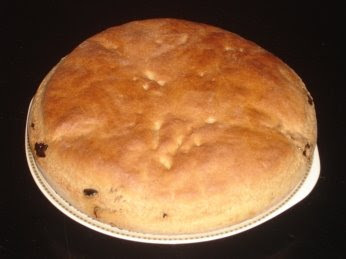 When the dough has reached twice its size, place the olives in it and knead again for a few minutes. Prepare a round 25cm baking tin by buttering the bottom and sides and sprinkling a little flour in it. Place the dough in it and again allow it to double in size. Bake in a pre heated oven at 220 degrees for 30 minutes or until it has turned golden brown. Remove the bread and wrap in a clean cloth until it cools. I love fresh bread and olive bread is lovely so I bet this is every bit as delicious as it looks! I had some olive bread yesterday actually. I am also Greek so love your recipes..
what do you mean by "strong white flour". I'd love to make this and have whole wheat flour and white bread flour. I also would like to know what "strong white flour" is. Devora - sorry, perhaps the translation wasn't good. It means hard (not soft) white flour.